A Ferrari car is parked at the entrance of the New York Stock Exchange in New York. BALOCCO, Italy (Reuters) -- The initial public offering of Ferrari is expected to happen between the second and the third quarter of 2015, said Sergio Marchionne, CEO of parent Fiat Chrysler Automobiles. Marchionne said last month he would spin off Ferrari from the group, sell a 10 percent stake via a public offering and distribute the rest of FCA's stake in the luxury sports car brand to its shareholders. The spinoff is part of a bigger capital-raising plan that also includes a $2.5 billion convertible bond issue to help cut debt and fund an ambitious business plan at the world's seventh-largest carmaker. Marchionne said Tuesday that after the capital raising, the U.S. free float of Fiat Chrysler could increase to around 20 percent of the group's capital. A roadshow to market the capital raising with U.S. investors is planned for December, he said. 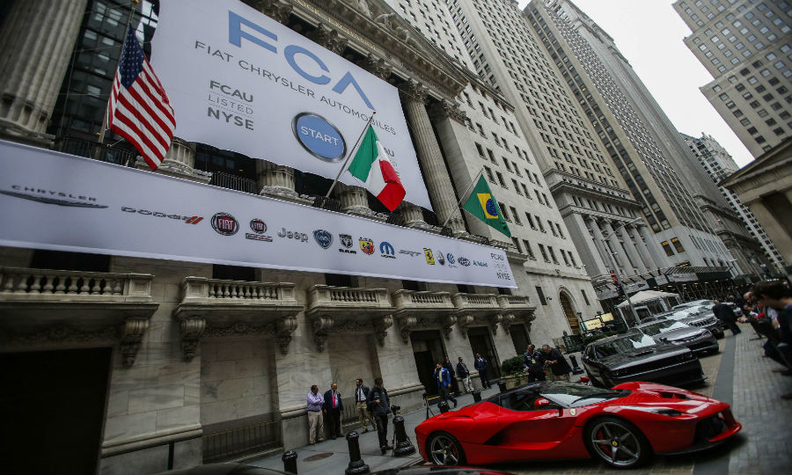 Fiat Chrysler moved its primary listing to New York last month.